Point-and-click fans, this next game has you written all over it. Submachine is a relatively easy game of the escape-the-room variety that will engage your puzzle-solving skills for about 10-15 minutes. 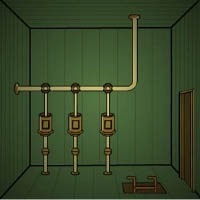 And if you haven’t played this one already, you’re in for a simple treat.Several rooms hold as many puzzles and items to find for solving the mystery of the Submachine. Use your mouse to point and click your way through the game, and to pick up items that you find along the way. Drag and drop an item from your inventory to place it where it’s needed. Crisp and attractive graphics are pleasantly complemented by atmospheric sound and effects to enhance the overall experience. Created by Mateusz Skutnik, Submachine is a straightforward and polished point-and-clicker that is accessible to most anyone.